If this is a class assignment, make sure you understand what your teacher is asking for. Your teacher may have provided you with a project description, worksheet for taking notes, or a rubric. Click here for a list of questions from CRLS that will ensure you understand the assignment. NOTE: If you don't understand what information you need to research, then ask your teacher for clarification. NOTE: At the end of this video, the boy decided who he would interview and that he needed to do a oral and multimedia presentation. With a multimedia presentation he could videotape or record (audio) his interview, take photos of his grandfather, add music to his project, etc. Need help selecting a research topic? If your teacher has not assigned you a specific research topic and you must choose one for yourself, then you may be interested in getting some help in picking one. Click here for tips from CRLS on selecting a research topic. The CRLS Research Guide provides excellent tips on how to approach picking a research topic, starting with selecting a general topic and learning how to focus it into a topic you can use for your research project. Select a general topic that interests you in some way. List key words to help you look up information about the topic. Go to an encyclopedia, or other reference source, to get an overview of the topic. Make source cards for whatever sources you will use for information. Using the general overview, begin to focus the topic into something you can cover well. What information do you need to find? What information are you looking for.? Remember to ask focused questions. And practice asking good questions. Click here for tips from CRLS on Brainstorming Research Questions. Why was Scott Joplin notable? When was he born and when did he die? Was his birthplace or childhood home any influence on his career? How did his childhood influence his adult life and his career choice? Who in his life were his influences or his role models? Why do we remember him now? What did he do that is an influence on my life or that of Americans today? How did he develop ragtime music? What instruments did he play? Of course, as you find information on Scott Joplin, you will use some that is not included in your original questions. Use these questions as a place to get started. You won’t waste as much time if you have a place to start. Once you have a research topic, you should start by writing down the Statement of Purpose or the "problem you want to solve". It will guide you as you do your research. 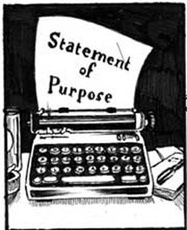 Click here for tips from CRLS on Writing a Statement of Purpose.